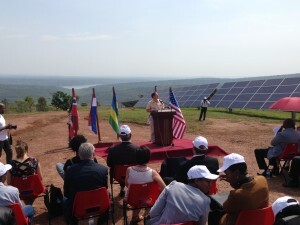 (Kigali, Rwanda) - Only 12 months after the official signing of the Power Purchase Agreement (PPA), Gigawatt Global has succeeded in financing, constructing and interconnecting a $23.7 million solar energy plant, culminating in a ceremonial ribbon-cutting event. Rwanda’s Minister of Infrastructure, Hon. James Musoni, and the Chief of Staff of the U.S. Government’s Overseas Private Investment Corporation (OPIC), John Morton, will lead the ribbon-cutting on Thursday, February 5, at 12:30pm of the 8.5 Megawatt (MW) solar field at the Agahozo-Shalom Youth Village (ASYV), and will be joined by international representatives of the partners that developed the landmark project. The Rwanda field - constructed in the shape of the African continent - brought together an international consortium of financing partners. Debt was provided by FMO (Netherlands Development Finance Company) and the London-based EAIF (Emerging Africa Infrastructure Fund); mezzanine debt provided by Norfund (the Norwegian Investment Fund for Developing Countries); equity from Scatec Solar ASA (who also served as EPC contractor and serves as O&M provider), Norfund and KLP Norfund Investments (a vehicle jointly owned by KLP, the largest pension fund in Norway, and Norfund). Grants were received from the United States Government via OPIC’s ACEF (Africa Clean Energy Finance) grant and from the EEP (Energy and Environment Partnership) Programme, a partnership of the Finnish, Norwegian and Austrian governments. SEDI Labs served as a key project development partner. Norton Rose Fulbright from London served as the international legal counsel. The Rwandan project is built on land owned by the Agahozo-Shalom Youth Village, whose mission is to care for Rwanda’s most vulnerable children orphaned before and after the Rwandan genocide. The village is leasing land to house the solar facility, the fees from which will help pay for a portion of the Village's charitable expenses. Gigawatt Global will also be providing training on solar power to students of the Liquidnet High School on the grounds of the Youth Village. "Anne Heyman, our Founder of blessed memory, held to a vision in which the Village practiced tikkun olam, the Jewish teaching to help heal the world. In addition to our work with Rwanda's most vulnerable children, we're now helping to improve the lives of thousands of people through sustainable electricity generation,” said Laurie Toll Franz, ASYV's Board Chair. Gigawatt Global is one of almost 90 private sector partners involved in the U.S. Government’s Power Africa Initiative, which is designed to increase access to electricity throughout all of sub-Saharan Africa. By providing creative financing, business development support and commercial advocacy through various U.S. Government agencies, Power Africa represents a new model of development which facilitates the work of its partner companies in developing new energy sources, including wind, solar, hydropower, natural gas, and geothermal resources in all of sub-Saharan Africa. 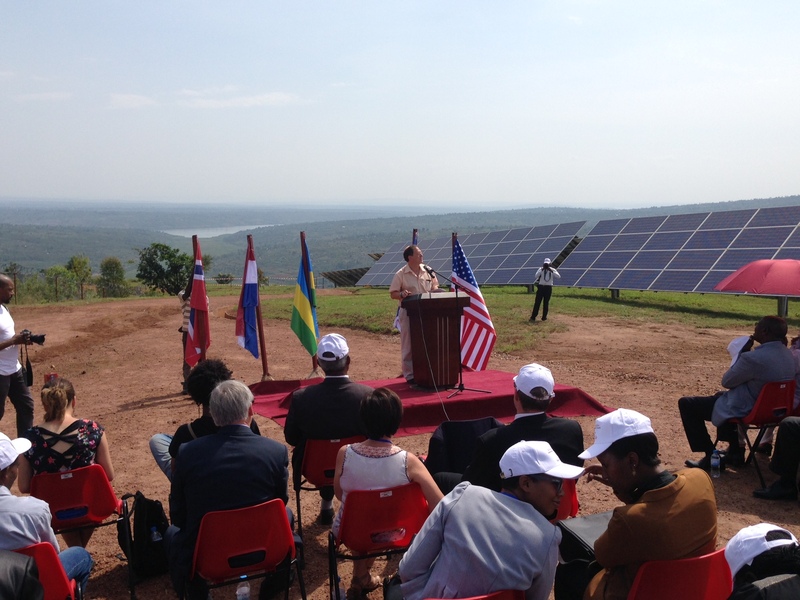 “The people of Rwanda should be proud to host the first utility-scale solar power plant in East Africa, and we hope that the pioneering spirit of Rwandan authorities may serve as an inspiration to other countries in the region. The ASYV project will be an important source of clean and reliable electricity for the next 20 years and beyond, and we are proud of having made this possible in cooperation with our partners Gigawatt and Norfund,” said Torstein Berntsen, Executive Vice President of Scatec Solar ASA. Gigawatt Global’s 8.5 MW solar field in Rwanda is the first utility-scale project to reach financial close and come online under the Africa Clean Energy Finance (ACEF) program, which is now an integral part of the Power Africa Initiative. Gigawatt Global, an American-owned Dutch company is an impact investment platform and leading frontier solar developer with a proven track record in the development, financing, construction and activation of commercial-scale solar energy fields in emerging markets—targeting 1,000 MW of solar power in Africa by 2020. The company’s vision is for a world in which developing nations will be powered predominantly by clean, safe, affordable, renewable energy. Clean energy will not be a luxury that only wealthy nations can afford, but will be the energy of choice for lifting people in developing countries out of poverty. Gigawatt Global mobilizes the ingenuity of our international team to reduce the world’s dependence on fossil fuels and empower people globally. Launched on June 30, 2013 by President Obama, Power Africa brings together the combined expertise and resources of 12 U.S. Government agencies, with African governments, the private sector, multilateral and bilateral partners to increase energy access, remove barriers to energy development and to promote and improve governance of a growing power sector throughout all of sub-Saharan Africa. Power Africa has set an ambitious goal of adding 30,000 megawatts of new, cleaner electricity generation capacity and increasing electricity access by at least 60 million new household and business connections in all of sub-Saharan Africa. To date, Power Africa has mobilized more than $20 billion in commitments from 90 private sector partners, and an additional $9 billion through strategic partnerships forged with the World Bank, the African Development Bank, and the Government of Sweden. Chaim Motzen, Managing Director and Co-Founder of Gigawatt Global, led the successful development of the first utility-scale solar field in East Africa in record time, an 8.5 MW plant in Rwanda which reached full production in September 2014 and increased Rwanda's generation capacity by approximately 6%. Chaim is a former consultant at McKinsey and Company, where he was awarded “The Marvin,” McKinsey’s highest award for non-partners, recognizing exceptional work in knowledge building. He received an MBA from Harvard Business School and an MPA from Harvard Kennedy School. Chaim is on the Board of Directors of the Gift of Life Bone Marrow Foundation, a world leader in facilitating bone marrow transplants for children and adults suffering from life-threatening diseases. Yosef Abramowitz, a human rights activist, educator and entrepreneur, is President of Gigawatt Global, an impact investment platform that advances the environmental and humanitarian goals of providing affordable green power to underserved populations. Nominated three times for the Nobel Peace Prize, Abramowitz is recognized as a pioneer of the solar energy industry and co-founded the solar industry in Israel. He was named by CNN as one of the six top global “Green Pioneers,” and by PV Tech as one of the world’s most inspiring solar CEOs.